The Fredericksburg Chamber of Commerce Golf Tournament, to be held at Boot Ranch on October 13, will open to the general public (not just Chamber members) tomorrow, August 1. For a registration form, send e-mail request to Nancy Sparks. Kevin Fowler and Gary P. Nunn will be in Harper, Texas for a Street Dance in the Park Saturday at 7:30 pm! Admission is $20. Please call 830/864-4912 for more information and visit www.kevinfowler.com for online ticket sales. Come enjoy an evening of original storytelling filled with passion and creativity at an open-to-the-public Independent Author's Guild Book Festival this Friday, July 24 from 6:30-8:30 p.m. at Berkman Books, 416 E. Main Street. Meet Central Texas writers from the Independent Authors Guild as they share their stories. For more details, call 830-997-1535. Dogs play an important role in todays military. Learn more by attending the War Dog demonstration with active military personnel and their dogs this Saturday, July 25 at 10:30 a.m. at the National Museum of the Pacific War, 340 E. Main St. At 1:30 p.m., the documentary film, War Dogs of the Pacific, will be shown with a program presented by the film director. For details, call 830-992-2785. All nine wineries making up the Wine Road 290 wine trail will join forces this Saturday, July 25 to host "Chili and Chillin'" with Texas chili or Southwestern chilies matched with perfectly chilled Texas wines! Enjoy music, fun, and great food from area restaurants. The Nest Restaurant, located at 607 S. Washington St. in Fredericksburg, has new hours. The restaurant is open for lunch business Tuesday-Friday from 11:30 a.m. - 2:30 p.m. (no reservations are needed for lunch), and is open for dinner on Friday and Saturday from 5:30 p.m. until closing. The restaurant is closed on Sunday and Monday. For information, call 830-990-8383. The Fredericksburg Pioneer Museum Roots Music Concert series presents Blues and R&B on Saturday, July 25, 2009. Gates open at 5 p.m., with the music from 6:00 to 10:00 p.m. The Pioneer Museum is located at 325 West Main Street in Fredericksburg, with concert entrance on Milam Street. 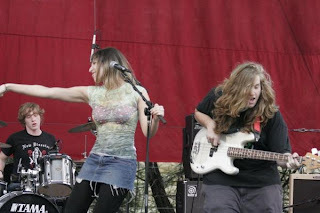 Scheduled to perform are: Blues Mafia--They met as students at the Austin School of Music, and have gone on to play high-profile gigs and record a CD. The five talented youngsters describe their sound as old-school rock, funk, soul and jazz; Blues Specialists--The Blues Specialists were established by Austin's Blues legends TD Bell and Erbie Bowser. The current lineup plays traditional Texas jump blues with a touch of jazz, in the style of T-Bone Walker; and Guitar Shorty --Born in Houston, raised in Florida, Guitar Shorty has played guitar since before his hands fit around its neck. As a teenager he ended up in New Orleans, soon fronting his own house band and playing with greats T Bone Walker, Big Joe Turner, Little Richard, Sam Cooke, and Ray Charles. Learn how to choose, grow and use Mediterranean herbs in the kitchen during this free class presented by Carol Seminar, certified master gardener at Woerner Feed & Garden Supply, 305 S. Lincoln Street, Saturday July 18 at 10:30 am. To sign up for this class, please call 830/997-2246. This big game celebration is sponsored by the Texas Wildlife Association will be held at Hanger Hotel on Highway 16 South from 4-9 pm July 18. Enjoy seminars, kids' educational activities, food, drinks and the awards ceremony. 40 of the top whitetail deer taken in the Hill Country will be on display. Cost TBA. Please call 800/839-9453 for more information. Celebrate Texas wine and unique Hill Country cuisine at Cabernet Grill on Highway 16 South Wednesday, July 15. This multi-course dinner will feature Texas winemakers. Cost is $59.95 per person, plus tax and gratuity. Please call 830/990-5734 for reservations. Congratulations to Becker Vineyards on its recent honors at the San Francisco Wine Competition 2009 in San Francisco, California (land of California wineries). The following Becker Vineyards wines were chosen: 2008 Viognier (Silver), 2008 Syrah (Silver), Cabernet Sauvignon Reserve (Brenda Canada Vineyards)(Bronze), 2008 Sauvignon Blanc (Andrew Martin Vineyards)(Bronze) and 2007 Claret (Bronze). The Fredericksburg Tennis Association (FTA) is hosting their monthly tennis social at the Lady Bird Johnson Park Tennis Courts on Highway 16 South on Sunday at 6pm. The event is free to members, with guests playing and eating for $5. Memberships to the FTA are available. Please call 830/990-7503 for more information. 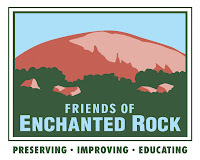 Friends of Enchanted Rock is raising funds to provide new signage to the Enchanted Rock State Natural Area until July 31. Plans are to construct new directional signage on the trails and provide a new interpretive kiosk in the gazebo area. This much-needed visitor amenity is only partially funded, so your tax deductible donation is needed! Individual support levels are $25 - $50 - $100; Business support levels are $250 Limestone, $500 Quartzite and $1,000 Granite. Mail your donations to Friends of Enchanted Rock, 10921 Hollow Ridge, Helotes, Texas 78023 or to donate online. The two-hour National Park Bus Tours for the LBJ Ranch, Sauer- Beckmann Living History Farm and the Texas White House are available daily – one at 11:00 a.m. and one at 2:00 p.m. Self-guided personal vehicle tours with loaned CD audio are available throughout the day. For more information, please contact the Lyndon B. Johnson National Historic Park at 830-868-7128. Learn what to look for at the Farmers' Market from Fredericksburg Culinary Arts, at Fischer & Wieser's das Peach Haus, 1406 Highway 87 South, Saturday from 3-5 pm. Cost is $49 per person. Please call 830/997-8396 reservations. Celebrate July 4th at the Sauer-Beckmann living history farm, located within LBJ State Park & Historic Site in Stonewall. A great outing for families, visitors can enjoy horseshoes, washer pitching, stick-horse races, & lots more fun and games. No admission. The Sauer-Beckmann living history farm is located east of the visitor center and off the nature trial, all within LBJ State Park & Historic Site. 2 miles east of Stonewall and 14 miles west of Johnson City on US Highway 290 toward Fredericksburg, the park is adjacent to both Ranch Road 1 and US Highway 290; enter on Park Road 52 off of US Highway 290. Enjoy an old fashioned 4th of July parade and patriotic program, then a band concert with fireworks in the evening. At 8:00AM enjoy the kids' costume parade around Marktplatz. Watch the parade on Main Street at 10:00AM, then Marktplatz for the patriotic program at 11:30AM and at Ladybird Johnson Park for a concert and fireworks starting at 7:00PM. All of these events are free and open to the public. Please call 830/997-6891 for more information.